In June 2009, visions of fireballs and impact craters began to dance grimly in Mary Kelleher’s head. She’d gotten word that a giant, high-pressure natural gas pipeline was coming to her little piece of heaven in the Trinity River bottomlands of east Fort Worth—part of an unprecedented gas-drilling boom in North Texas. Enterprise Products Partners, one of the dozens of drilling outfits capitalizing on the frenzy, would be building a 30-inch transmission pipe under a vacant lot next door to Kelleher, a few dozen feet from her home. The blast radius for a pipeline of its size and pressure, she discovered, was about 700 feet. Kelleher, a supervisor in Tarrant County’s juvenile courts, had just fin- ished building her dream home, a country-style brick affair just above the river’s floodplain. An inveterate animal lover, she has 12 acres overrun with goats, donkeys, ducks, llamas, chickens and nine rambunctious dogs—a rustic farmette in the middle of the bustling metroplex. Like many in Fort Worth, she’d already had natural gas wells cropping up around her place, and the paltry royalty checks—$200 total, so far—had done little to assuage her fears over air pollution from the wells and compressor stations. She was also worried, even before the pipeline went in, about the “sulfurish” taste of her tap water, which she attributes to the fluids used to extract the gas. Kelleher has plenty of company: More than 14,000 wells have been drilled in North Texas’ Barnett Shale, and upwards of 1,200 in Fort Worth alone. They’re in backyards, cemeteries, church grounds, parks and university campuses. In the early days—all of six or seven years ago—it seemed like a gift. Natural gas produc- ers were flush with profits, and many citizens thought their biggest headache would be figuring out how to wring the fattest royalty check from the companies. The backlash didn’t take long to commence. At first, when the wells began popping up, the complaints were of a “not in my backyard” nature—noise and commotion from the construction and the big trucks. Then residents like Kelleher began to ask whether their air and water were being fouled. (A growing body of evidence, not yet conclusive, says that they are.) Now the next phase of the backlash is in full gear. All those wells, upwards of 6,000 eventually, necessitate pipelines—“gathering” pipelines that move raw gas from wells to processing plants, and larger transmission pipelines to move processed gas to far-flung destinations across the state and country. Roughly one-quarter of the pipelines have been built so far. What’s happening in Fort Worth is something entirely new. The vast majority of Texas’ 360,000 miles of pipeline, the most in the nation, are located in rural areas, a safe distance from homes, schools and businesses. It’s one thing to build high-pressure pipelines filled with highly flammable gas in rural areas. It’s quite another to do so in one of the country’s fastest- growing metro areas. Feeling like they’re part of a massive, highly flammable experiment is scary enough for many residents. But a series of major gas-pipeline explo- sions in the past year has focused increased attention on the dangers of building a lightly regulated pipeline system beneath the Metroplex. Last November, an aging pipeline owned by El Paso Natural Gas blew up on the edge of a residential subdivision near Bushland, west of Amarillo, with the force of a magnitude 4.0 earthquake and temperatures of 7,000 degrees Fahrenheit. A column of flames soared hundreds of feet in the air. A nearby home was incinerated, 150 residents were evacuated, and three people were injured, including a 15-year-old girl who was badly burned. “I don’t think any of us knew we were sitting on a mini-nuclear weapon,” one resident told the company at a packed community meeting after the explosion. This June, two deadly accidents occurred on con- secutive days in Texas. First, workers drilling holes for new utility poles struck an Enterprise pipeline near Cleburne, south of Fort Worth. Eyewitnesses said it was like an earthquake. Flames from the fire- ball shot 300 feet high, visible 20 miles away. James Neese, a contractor from Oklahoma, was instantly killed. An investigation by the Texas Railroad Commission found that the company had failed to mark the pipeline as required, so Neese and the other workers had no way of knowing it was there. The nearest marked line was a quarter-mile away. The state offered to settle with Enterprise for $120,000. A day later, construction workers operating a bulldozer hit another unmarked pipeline—this one owned by a company called DCP Midstream—near the tiny Panhandle town of Darrouzett. The fiery blast killed two men and seriously injured another. Those blow-ups occurred in relatively unpopu- lated areas. But late this summer, North Texans like Kelleher saw on their TV screens a horrifying vision of what could happen in the Metroplex. On Sept. 9, a pipeline in a residential area of San Bruno, Calif., ruptured and ignited with the force of a space-shuttle launch. Eight were killed, more than 50 injured, and dozens of homes torched. Federal investigators are still searching for the cause. That string of disasters demonstrated how cata- strophic urban pipeline explosions can be. As the Barnett Shale frenzy continues, the accidents have also spurred criticism of a shoddy regulatory sys- tem riddled with loopholes—and an industry that increasingly puts profits over safe operations. Lodbill, like other critics, says state regulators and Fort Worth officials have been slow to recognize the potential threat, much less quantify it. He estimates, based on the frequency of pipeline accidents from 2004 to 2007 in the Barnett Shale, that once 5,600 wells and their associated pipelines are built in Fort Worth, “significant” incidents involving injuries, deaths or major property damage could become a regular occurrence. Like many of her neighbors, Mary Kelleher quickly learned there was nothing she could do to stop the pipeline next to her house—or to get it moved. It was almost impossible to get basic information about the project. Decades ago, the Texas Legislature gave private pipeline owners extraordinary power of emi- nent domain: They have the right to seize property and lay pipeline wherever they like, with citizens, and state and local governments having little or no say. But the environmental impact was small potatoes compared to Kelleher’s mounting worries about the pipeline that now runs 65 feet from her bedroom window. To get basic information about where and what the pipeline was supposed to be, Kelleher had to file an open-records request with the Railroad Commission. The documents she eventually got were hardly reassuring. For instance, a questionnaire Enterprise filled out in order to get its operating per- mit lists the pipeline’s wall thickness and pipe grade as “unknown.” The pipeline’s pressure is listed as “to be determined.” That was good enough to get the Railroad Commission’s approval. Kelleher has drawn her own conclusions. “The gas companies seem to be allowed the discretion to do as they please without consequence. The Railroad Commission has no teeth into holding them respon- sible for their actions or lack of actions. While North Texans fret, these are halcyon days for the natural-gas business. About a decade ago, innovators in the industry pioneered a new drilling technique called hydrofracturing—or “frack- ing”—in which water and chemicals are injected deep underground to release gas from tight rock formations. First used in the Barnett Shale, fracking has unlocked trillions of cubic feet of unconventional natural gas, first in North Texas and then in New York, Pennsylvania, Louisiana and West Virginia. It’s spurred a bonanza for producers and been embraced by politicians eager to chart a new direction for the nation’s aimless energy policy. Nowadays pipelines are regularly built, sold and resold many times over, “flipped” like overpriced homes during the lustiest days of the housing market. The number of pipeline operators has skyrocketed. Many specialize in gas production, not pipelines, but have created subsidiaries that build and operate pipe- line systems. Others are what the big companies call “mom and pop” outfits, lightly capitalized fly-by-nights trying to strike it rich in America’s great gas play. Ten years ago, when the Texas Railroad Commission was under Sunset review—a once-a- decade, top-to-bottom review of state agencies—the Sunset Advisory Committee recommended that the commission oversee rural gathering lines. But legis- lators, loath to upturn the industry’s campaign-cash gravy train, ignored that recommendation. The upshot is that many gathering lines never have to be inspected, nor are they required to have integrity management plans, a key tool in prevent- ing disasters. They also don’t have to be injected with an odorant, which helps alert people to gas leaks. Yet many gathering lines are identical in size and pres- sure—and, thus, potential danger—to transmission lines, which are inspected. In the long run, the gathering lines running under the Metroplex might be even more dangerous than their transmission cousins. For one thing, they’re more susceptible to corrosion because the gas they carry is raw, containing corroding substances like water and salt. “They have all kinds of internal corro- sion problems,” says Deaver, who worked 33 years for Exxon Mobil and now serves as an expert witness for plaintiffs in pipeline-safety lawsuits. Jay Marcom can show you just how easy it is to hit a pipeline—and he can also testify how hard it is to know where they’re located with any cer- tainty. A salty rancher, Marcom owns 1,600 acres an hour-and-a-half west of the sprawling Metroplex. Eighteen months ago, he nicked an 8-inch pipeline with a backhoe while digging a new culvert. The line was buried only about an inch; though it was relatively small in circumference, it carried about 1 million cubic feet of gas per day. “I could have been a crispy critter,” Marcom laughs, pointing to where he nicked the line. As required by law, Marcom had duly informed the “Call Before You Dig” hotline before he dug, and three pipeline companies had come out to mark their lines. Two of them had lines nowhere near the site where Marcom wanted to dig. The third, Ranger Gas, marked a line about 500 feet from the spot. To do so, the company men resorted to the ancient technique of “witching,” using two pieces of metal. “When the metal crossed, they said, ‘That’s where it is,’ ” Marcom says. Deaver, the pipeline expert, says that where many gathering lines are concerned, “they’re out there like the wild, wild West, unregulated,” he said. In the last decade, safety inspections of pipelines have decreased in Texas. In 2001, there were 2,639 inspections; in 2009 there were 2,171—a decrease of more than 17 percent even as more pipe went in the ground. Texas spends less on pipeline safety per mile than Oklahoma and Louisiana, also major gas-producing states. New Mexico spent more than double in 2008 on pipeline safety, according to Railroad Commission data. The commission has been reluctant to fine compa- nies for safety violations. In 2008, for example, state inspectors identified more than 2,400 pipeline safety violations but only assessed $43,000 in fines—about $18 per violation. On the other hand, the commission rolled out a damage prevention program in 2008 that levies fines for mismarking pipelines or not calling 8-1-1 before digging. 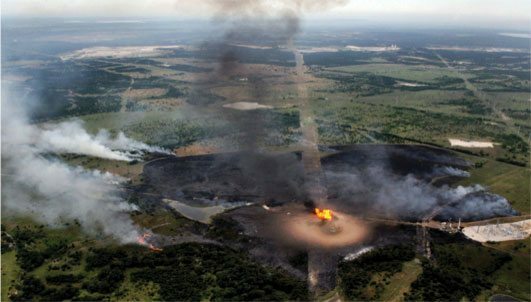 Nye points out that more than three- quarters of all pipeline incidents in Texas are caused by third parties accidentally hitting pipelines. In 2010, the Railroad Commission issued more than $1.5 million in fines. History and a passing familiarity with the power of the oil and gas industry in Texas will tell you it’s unlikely the Texas Legislature will curtail the pipe- line operators’ power to locate pipes anywhere they like. But as pipelines encroach on populated parts of North Texas, pressure is growing on cities and the industry to build the infrastructure as far away from people as possible. Last year, the Fort Worth City Council passed a gas-drilling ordinance that gives the city some say over pipelines’ routes and safety stan- dards. Several experts tell the Observer, however, that the pipeline industry could challenge the ordinance in court if the city enforces it too aggressively. “I think it’s an open-ended question of how far the cities are going to go,” says Sarah Fullenwider, an attorney with the city of Fort Worth. “We try very hard to find that middle ground,” she says, between protecting the public and assisting the industry in getting gas to market. That’s not enough for activists and concerned residents on the frontlines—folks like Steve Doeung, Fort Worth’s pipeline hero. A voluble and impassioned man who’s struggling with Lyme disease, Doeung showed citizens how to drum a pipeline out of a neighborhood: through sheer, cussed stubbornness. In spring 2008, Chesapeake Inc.—the granddaddy of gas outfits—announced plans to bury a 24-inch gathering line in the front yards of Carter Avenue, Doeung’s ethnically diverse, middle-class street just south of Interstate 30. The pipeline was to serve a controversial well just east of the neighborhood next to the Tandy Hills Natural Area. Everything about the pipeline rubbed Doeung the wrong way: the sei- zure of working people’s front yards; the bullying tactics Chesapeake used to get his neighbors to sign on the dotted line; the way the city looked the other way; and, most of all, the thought of his 8-year-old daughter playing atop a dangerous pipeline. Chesapeake quickly moved to acquire easements from homeowners, by hook or by crook. And Doeung went to work. He helped organize his neighbors, who pressured Chesapeake into downgrading the pipeline to 16 inches. Still, with the threat of costly and difficult condemnation proceedings, most homeowners caved. By August 2008, Doeung was the lone holdout. “They were waving around that eminent-domain authority,” he said of Chesapeake’s landmen. Doeung took his fight to court, dragging out the condemnation proceedings for a year and a half. In a legal sense, Doeung lost. In March, a judge signed an order allowing Chesapeake to take his property. But meanwhile Sen. Wendy Davis helped broker a deal between the Texas Department of Transportation and Chesapeake to re-route the pipeline along the department’s I-30 right of way. The pipeline isn’t in the ground yet, but Doeung is declaring tentative victory.